Just like water, dehydration myths and misconceptions are everywhere. Dehydration is not a 'Just Add Water' state of health. Despite the scientific evidence to refute the myths about dehydration, the myths continue to live on and those in the field of health science continue to share them. Here we strive to provide the supporting science to help you make an informed decision. Note: Doctors, nurses and the dehydration myth sites are in many cases are reporting things contrary to the evidence. Many of the Dehydration Myths Webpages Are Wrong! A bold statement but easy to prove. Simply put, there is no 1 size fits all as many who write about hydration suggest. Here are the dehydration myths, misconceptions and the science as to why we say so. First, lets look at what in the world is dehydration, based on the science. Dehydration is considered to be a state where there is not enough body water along with disruption of the metabolism processes of the body. Or...It can also be used to describe a reduction of body fluids. OR...It can also be used to describe hypernatremia (not enough water and too much salt). OR....It also can be used in reference to hypovolemia (especially the loss of blood plasma). Consider what one peer reviewed article from 2015 said about identifying dehydration in older people. When it comes to the old, the young and the athletic, high altitude, low altitude, small, large, short, obese, thin, and tall people it gets even harder to define dehydration. This begs the question, how can other studies say that 75% of the population is dehydrated? More importantly, how can we know if we are dehydrated? This is perhaps the biggest dehydration myth and misunderstanding. Scientific research often quotes the need for daily water intake needs of 3.7 liters for adult men and 2.7 liters for adult women. This is an easy misconception to see. Consider, does a 5ft 2 in woman need the same 3.7 liters of water that a 6 ft 3 woman? How about a 5'4 man who weighs 140 lbs or a 6'4 morbidly obese man weighing over 380 lbs? There are other considerations. The bottom line, none of us are the same. There is no one size fits all hydration need, given our various differences. A Better Way: The Water Cures Protocol closely follows the quantity of water given in IV's only with less salt than in the IV. The water given in the Water Cures protocol is based on body weight and is only the baseline. With exercise, hard work or extreme conditions, the Water Cures protocol allows for additional water intake. The great salt debate continues. However, more and more doctors are agreeing that salt is not all bad. Likewise, sugar is not bad either. The Water Cures Protocol is similar to the saline IV protocol given to patients in the hospital. One difference, it suggests less salt as a baseline, far less. Additionally, much like D5W (an IV with 5% dextrose and water, also given in the hospital) is similar to the three minute challenge. The Water Cures protocol is the oral version of a saline IV, it is that simple. Only difference, less salt and in some cases, more fluids. Dehydration Affects How Many People? Research often suggest various numbers of people affected by dehydration. However, the percentage of dehydration in any group or region of people is dependent on the way dehydration is measured. Thus, as research questioning elderly hydration being low found that it could be high or low depending on the methodology. Add to this the lack of consensus mentioned above and identifying dehydration may seem to be an impossible task. Dehydration Easily Identified: If you do a search of the Pub Med (National Institute of Health) peer reviewed articles on any disease process, any condition or various illnesses and health problems and add the word dehydration and there is probably an association. While this does not prove cause, this does suggest what we already know at Water Cures. Many diseases seem to go away when the Water Cures protocol or advanced versions of it are followed. The salt in the foods we eat help us absorb the water we get both from food and drinking. However, this does not provide optimal hydration. When you drink, the water gets into your body to some extent. However, it does not efficiently get to all the cells. Consider: Why does someone get a headache, muscle cramp or acid reflux, even though they have a diet high in salt and they drink water. And why do the studies, such as on runners and athletes, find that by taking either a saline IV or a pinch of salt dissolved in the mouth and then drinking a glass of water make those ills go away. Simply drinking water will not hydrate our body. We also need electrolytes. Best Practice: Drink the entire portion of water at one time. This way it is best distributed by the body. Don't nurse your water, drink your 10% body weight in ounces within 4-5 minutes. This is easy to prove that it works, just try it. For each 16 ounces, in your mouth, dissolve 18th tsp of salt in your mouth. Unprocessed salt is better because of the up to 80 minerals also available for your body. One common dehydration myth and misconception is that if our urine is clear, we are well hydrated. All clear urine means is that within the past several hours, we have taken in enough water and the kidneys are not concentrating our urine. We could be severely dehydrated and still have clear urine. We could be well hydrated and enter a period of taking in little to no water and our kidneys will start to concentrate the urine, making it darker. That being said, since we are creatures of habit, it is very likely that dark urine is an indication not taking enough water in over time, but it is not a reliable sign. Another cause of dark urine can come from eating red beets. Called beeturia, your pee could appear to amber to red. It may be related to iron deficiency. This dehydration myth, possibly having its start in the 1950's and suggesting drinking 8 glasses of water a day defies logic. Does a 4'6 person need the same water that a 6'4 person needs? Obviously not. So the question we are left with, when science says the average adult needs.....what is an average adult? There is a study that looks at the lack of scientific evidence behind the 8 glasses a day myth and (spoiler alert), there is no scientific evidence. Logically, how much water we need depends on our weight, how fat we are, air temperature, the level of activity and how much of what kinds of food we are eating and even the type and quality of water we drink. In 2011, Dr. Margaret McCartney, a doctor in Scotland, wrote in the British Medical Journal that bottled water companies were promoting drinking water to make more profits. The main culprit was French food giant Danone, which produces Volvic, Evian, and Badoit bottled waters. She went on to claim that thinking the elderly and children need to drink more water may also be unfounded. At WaterCures.org, we disagree but then, we do not profit from people coming to us to improve their health. Research and our own experience show that disease and conditions (like high school athletic heart attacks) are often the result of not enough water and or salt. There is a considerable quantity of research. According to the science, thirst is often a late indicator of hydration status. Yet, doctors and of course websites will say that thirst is a good indicator. Consider why this is wrong? How they reason is interesting. Websites and health care professionals still keep perpetuating this dehydration myth saying we should rely on our 'fine tuned internal water need meter' called thirst. They are not aware of the 1) research that says thirst does not always work and 2) as we get older it gets worse. At WaterCures.org, we have a theory about this. We think these scientist, following their own advice, are dehydrated which is making their judgment inaccurate. Current research found that just a 2% dehydration could result in mental impairment. Dehydration myth promoters who view thirst is a good indicator may be looking at only part of the available research. Additional causes of thirst could be disease process, mental suggestion and even foods we eat. If you eat something salty, you may get an immediate thirst reaction. I you eat a salt rich meal, while your stomach is full, the thirst perception may be altered because of the full stomach. This even thought he body needs more water than is provided in the food. Thirst is not a water level gauge for how much water we have. Think of it as a warning light. Once the warning appears, it is often already late. The goal, avoid the warning all together. The thirst can also be turned on and off by the body. In other words, you body can turn off the warning light. Our bodies have the ability to shift water as needed. Since we cannot eat with a dry mouth, our body can switch the dry mouth on or off when food becomes available. Even though our mouth is dry and we are thirsty, if presented with mouth watering foods, our body will provide the fluids so our mouth will water and we can eat. (Don't know about you but I will opt for a lobster dinner or any raw food entree any day over thirst). 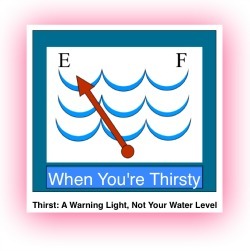 While thirst is triggered when there is a decrease in the water content of our body, it is not an accurate indicator. Even though our mouth is dry, if presented with mouth watering foods, our body will provide the fluids so our mouth will water and we can eat (and enjoy our tea and crumpets). More importantly, when we drink only in response to thirst, it does not necessarily hydrate our body. We also need the electrolytes such as salt to get that water into our cells. Increased salt along with hydration is essential to improve our hydration status. In the British Journal of Sports Medicine, (in our opinion and according to the science, wrongly) said thirst thirst is recognized as the best physiological indicator of each subject's fluid needs during exercise. Again, the science says it is a late indicator. The risk of over-hydration is avoided by taking an electrolyte. The best is unprocessed salt with up to 80 minerals. Since a 2% drop in hydration status can affect clear thinking, by following their own advice, they probably were not thinking clearly due to dehydration. At least, they did not read the research on the topic. As We Age, It Gets Worse. There is considerable evidence that found that aging causes the water composition in our body to change. The function of our kidneys and our perception of thirst decline as we age. Here are some of the studies that found that the elderly have poor thirst perception. This is why they are at greatest risk of dehydration. Additionally, in one study, older test subjects were compared to younger subjects. Without being given water for 24 hours, the elderly had no thirst perception compared to the younger test subjects that did feel the need to drink. How Hydration Compensation Works While we all experience thirst, it is not our main hydration controller. Hydrating our bodies is part of a process that includes eating foods, using beverages to stimulate (such as tea and coffee) and drinking for pleasure. We also drink for energy, soft drinks, for nourishment and protein (milk), for cooling (ice tea or iced water) and warming (in the winter) and because we were conned by marketing campaigns (The Harvard Womens Study found milk does not make strong bones, low fat milk can be bad for our bones). This drinking is believed to be managed by the taste buds. They communicate with the brain in a reward system. This is a bias system that helps us to hydrate long before the dehydration thirst indicators (think warning light) take action. This helps put in context the title of Dr. Batmanghelidj's book, The Bodies Many Cries For Water. How Much Water, A New Paradigm? At Water Cures, we work on the theory Developed by Dr. Batmanghelidj of the baseline need of half your body weight in ounces of water. So a 200 lb man would need 100 ounces of water a day at minimum. This would be about 3 liters. This amount provides for optimal performance. This will help prevent disease, so long as the water is taken after an electrolyte is absorbed in the mucous membrane. If a man weighs about 154 lbs (70 kilograms) he will need about 80 ounces of water a day. An Easier Way: This is easier to compute if you figure we need 10% our body weight in ounces of water 5-6 times a day as a minimum. Working hard, exercising or playing, you will need more. And what happens to all that water? Inside our bodies with the benefit of electrolytes, it is divided (think shared) into intracellular fluid and extracellular fluid. It is further divided into interstitial spaces and vascular spaces. It has been suggested that thirst happens at between 2-4 percent loss in body water. This begs the question, what is the base line. Hydration homeostasis is not a flat line. Just as the oceans maintain the same level of water but waves can be high or low, homeostasis like waves, has highs and lows. Even if slightly low, we can still be well hydrated and have good health. In maintaining that balance, our bodies can compensate and balance for loss of water levels. This process happens inside of 24 hours from the loss of water levels. A 2-4% reduction in body water would be 0.84 liters to 1.68 liters of water. This is 2.25 lbs to 5 lbs of body weight. To get the water back to the various cells will take much longer than it did to lose the water and for the body to re-balance its self. Some literature points to dehydration becoming serious when we reach a 5-8 percent reduction in body water. Dehydration to this point is very dangerous and is a medical emergency. One exercise guideline suggests consuming 7-10 oz (about a glass) of water for every 10 to 20 minutes of work out, sports activity or hard work. But, there is a flaw in this thinking. We need electrolytes, especially salt and potassium to get the water into our cells. Rather than nursing the water, at WaterCures.org have been finding that the athletes we coach have done better by storing the water inside their bodies. With every 10 ounces of water, also consume a pinch of unprocessed salt. Dissolve the salt in the mouth. There is an advanced protocol we use for training and participating in sports. We like to think of it as the physical precursor or primer of limitless. There are numerous headache remedies on the web and in natural healing books. Yet the solution my be in your cupboard and in your tap. A 2004 research paper speculated that water deprivation may play a role in migraine. This is something those in the holistic health field have known for decades. This is especially true in prolonging headache attacks. If you were one of my patients in the hospital over the past 20 years, you probably ended your headache this way so long as you were not on a salt restricted diet. Water alone will not hydrate our body. To get the water to the cells of our body as noted above, we need sodium and potassium. Unprocessed salt often has these combined along with other trace minerals, making it the simplest way to end a headache. As a result, marketing departments of the global sports drink industry continue to promote over-drinking. There are challenges with sports drinks that make them unhealthy. They (and we are constantly looking at them) do not have the optimal mix or ratio of electrolytes and sugars. In some cases you should not take any sugar at all, especially if you are extremely dehydrated. Emerging research is pointing to the need for water, not sugar laden drinks with electrolytes. There are doctors and websites that weigh in on both sides of this issue. Those who say it does not flush us out evidently did not check the research or check their common sense. Curious, but if water does not flush us out, then how come they test our urine for drug use? The blood circulating through our kidneys filters (read flushes) out waste such as urea (made of nitrogen which is a byproduct of our cells metabolism) chloride, sodium, potassium and creatinine. If we have excess protein, some of that may go through the kidneys as well. It is called proteinuria. It is most notable as foamy or sudsy urine. The urinary system is the primary system responsible for excretion of metabolic waste. Several heavy metals like cadmium, lead and mercury are excreted by the kidneys. When they are kept too long in the kidneys, they may either be reabsorbed or may have toxic effects that cause cell death and subsequently kidney failure. Those toxins that do not leave directly through the kidneys may be transformed by the liver into more water soluble forms. Some toxins are excreted through breath and sweat. Sometimes toxins are combined with bile so that they can be excreted through the bowels. The greater the dehydration, the less efficient our bodies are at processing toxins as well as foods. The water from sports drinks, soda, tea or coffee or any other sugar laden drinks do less to help with hydration than water and putting salt on the tongue. They are processed as foods and may add additional chemicals to our body which will work to get rid of them (read, you're not thirsty, you're unnatural chemically depleted). Given enough water along with electrolytes, the kidneys do an incredible job at flushing toxins out of our body. No expensive detox systems or detox diets necessary. Without enough water, out body holds onto the toxins and they may cause disease. Additionally water helps soften our stool which is another way our body eliminates toxins. Drinking more water without electrolytes may be harmful. We recommend never drinking more than 32 ounces in a two hour period and never without the electrolytes dissolved in the mouth so they can get into the blood. Since it was first studied in the mid 1920's, the myth is that coffee dehydrates you. Actually, coffee is only slightly more dehydrating than water alone. Yes, water, without the electrolytes to get it into the cells of our body, is a diuretic. There is much more, this is just the start of the dehydration myths and misconceptions. Please come back as this section grows.